You are here: Home / Jewelry / Bracelets / A vintage Cartier sapphire bracelet (with a royal past). A vintage Cartier sapphire bracelet (with a royal past). 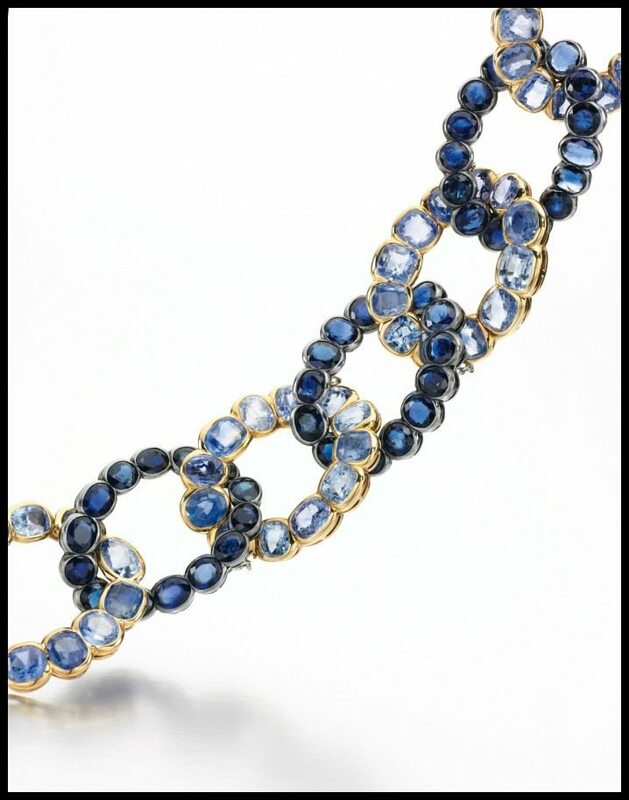 If you’re keeping up with your jewelry nerd-ery, you may recognize this vintage Cartier sapphire bracelet. This beauty is another piece from the renowned collection of the late Duchess of Windsor, Wallis Simpson. This piece is famous for adorning the fashionable Duchess’ wrist as she received the Queen for tea. Cartier made this beautiful piece in 1945. It is as bold and refined as most of the Duchess’ collection, with its remarkable silhouette and perfectly contrasting colors. Here’s the full-body view. 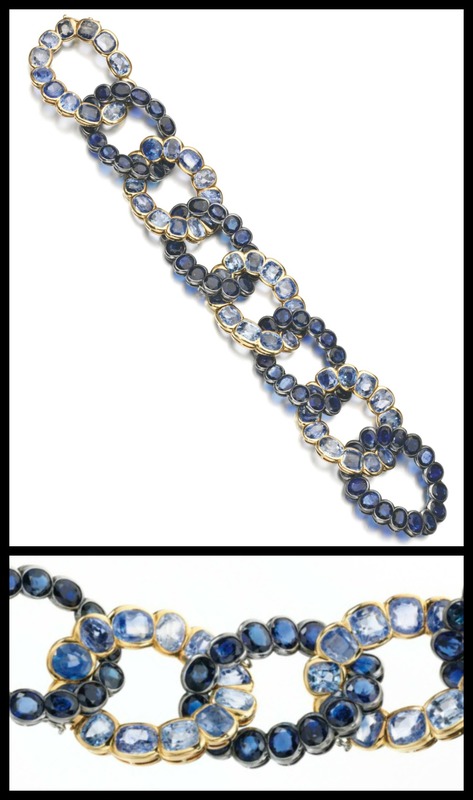 You can see here that the bracelet is formed of a series of linked ovals made up of alternating shades of blue stones. 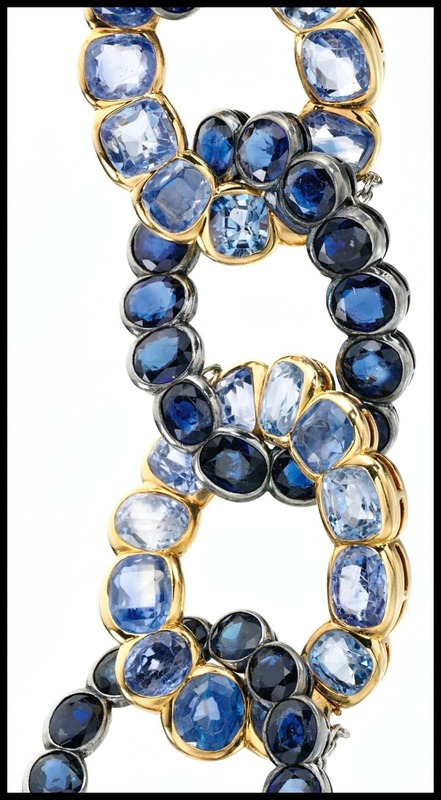 Now, to answer your first question: yes, those are all sapphires. Cartier managed to gather enough cushion cut sapphires in two distinct hues – of comparable size, opacity, and quality – to make an entire bracelet using only one kind of stone. It’s pretty mind-blowing. Here’s a closer look. I didn’t notice this right away, but only the lighter blue sapphires are set in yellow gold. Alternating the metal setting color in addition to the stone color adds another layer to the subtle design and color contrast of this piece. At this zoom level, it’s also possible to distinguish glimpses of small link chain attaching the oval loops of stones to one another. A subtle piece, but an elegant one. What do you think of it? Are you seduced by the masterful use of color and metal to create a quiet masterpiece, or would you prefer something bolder? This vintage Cartier sapphire bracelet was listed in a Sotheby’s auction. All images and info are thanks to Sotheby’s. I freakin’ swoon over this piece! The stones and the two tone metal- ah! Right?? It’s subtle, but SO well done that I just can’t get enough.